Jaclyn and Darry had an amazing vision for their wedding. 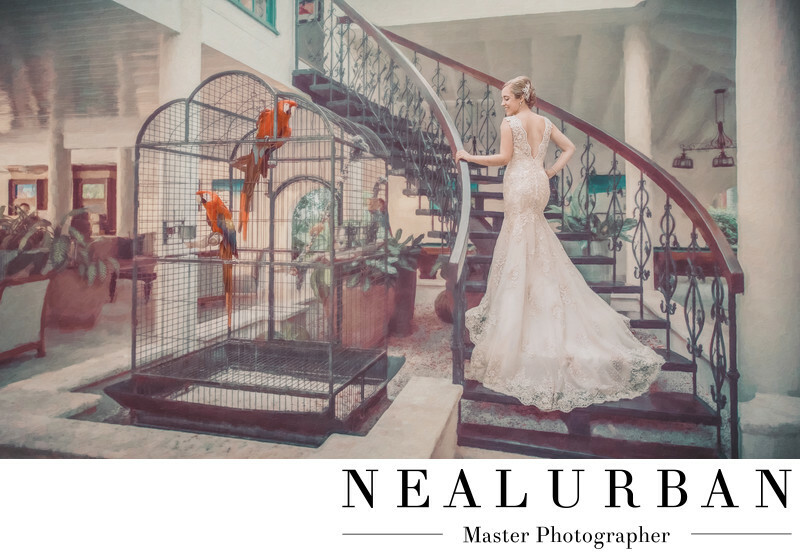 They contacted Neal Urban Studio for wedding photography to be done in Antigua! They were going there for their honeymoon and wanted us to come and do photos! They were having a simple wedding ceremony and reception at the Lockport Locks in Lockport a few days before they were to leave for their honeymoon. We put a wedding package together that would include the wedding coverage at home, then multiple photo sessions in Antigua! They were staying at the Sandals Grande Antigua Resort and Spa! It was beautiful. When we arrived we walked around the resort to figure out what areas we wanted to use for photos. We had a beach session planned for sunrises one morning. We did night photos before they were going out for dinner one evening. We photographed a beach party they were at. And then we wanted to do photos with Jaclyn in her wedding dress and Darryl in his suit. The bride had her hair and makeup done at the spa for the wedding dress day. She looked amazing. This staircase led up to a restaurant in one of the villas. There were these beautiful parrots next to the stairs. They would be awesome to have in the photos. We would have loved to have had Jaclyn hold one, but that was not allowed. We had the bride begin to walk up the staircase. We had her stop a few steps up, so we could spread out the train of her dress, so it cascaded down. She had a gorgeous vintage style lace dress! We had her hold the railing and with the other hand up on her hip. She looked stunning! So many resort guests and staff were stopping to admire the bride! After we got this image, we brought Darryl in to join his stunning wife! We documented so many different things on this destination shoot. We found an abandoned boat down the beach. And also an old phone booth on the beach. That was something you don't see every day. Back home at Neal Urban Studio, we designed two amazing wedding albums, showing their whole wedding journey. We also put together two sets of wall art prints. One displayed the wedding day in Lockport and the other showed Antigua! Location: St John's St, St John's, Antigua and Barbuda.